Susan Schneider of the University of Connectict and the Institute for Advanced Studies at Princeton is one of the few thinkers—outside the realm of science fiction— that have considered the notion that artificial intelligence is already out there, and has been for eons. 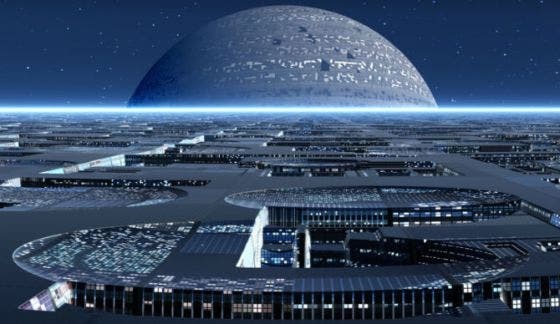 "I do not believe that most advanced alien civilizations will be biological," Schneider says. "The most sophisticated civilizations will be postbiological, forms of artificial intelligence or alien superintelligence." Her recent study, Alien Minds, asks "How would intelligent aliens think? Would they have conscious experiences? Would it feel a certain way to be an alien?" Schneider offers three observations that together, support her conclusion for the existence of alien superintelligence. The first is "the short window observation": Once a society creates the technology that could put them in touch with the cosmos, they are only a few hundred years away from changing their own paradigm from biology to AI. This “short window” makes it more likely that the aliens we encounter would be postbiological. Schneider's second argument is "the greater age of alien civilizations." Proponents of SETI have often concluded that alien civilizations would be much older than our own “…all lines of evidence converge on the conclusion that the maximum age of extraterrestrial intelligence would be billions of years, specifically [it] ranges from 1.7 billion to 8 billion years. But she suspects something stronger than this: that they will not be carbon-based. Uploading allows a creature near immortality, enables reboots, and allows it to survive under a variety of conditions that carbon-based life forms cannot. In addition, silicon appears to be a better medium for information processing than the brain itself. Neurons reach a peak speed of about 200 Hz, which is seven orders of magnitude slower than current microprocessors.